Several different illnesses are called "typhus," all of them caused by one of the bacteria in the family Rickettsiae. Each illness occurs when the bacteria is passed to a human through contact with an infected insect. These diseases are all somewhat similar, although they vary in terms of severity. The specific type of Rickettsia that causes the disease also varies, as does the specific insect that can pass the bacteria along. Epidemic typhus, which is sometimes called jail fever or louse-borne typhus, is caused by Rickettsia prowazekii, which is carried by body lice. When the lice feed on a human, they may simultaneously defecate. When the person scratches the bite, the feces (which carrys the bacteria) are scratched into the wound. Body lice are common in areas in which people live in overcrowded, dirty conditions, with few opportunities to wash themselves or their clothing. Because of this fact, this form of typhus occurs simultaneously in large numbers of individuals living within the same community; that is, in epidemics. This type of typhus occurs when cold weather, poverty, war, and other disasters result in close living conditions that encourage the maintenance of a population of lice living among humans. Some medical historians think that the Great Plague of Athens in 430 B.C. may have been epidemic typhus. Epidemic typhus is now found in the mountainous regions of Africa, South America, and Asia. 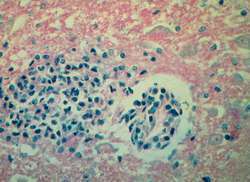 Brill-Zinsser disease is a reactivation of an earlier infection with epidemic typhus. It affects people years after they have completely recovered from epidemic typhus. When something causes a weakening of their immune system (like aging, surgery, illness), the bacteria can gain hold again, causing illness. This illness tends to be extremely mild. Endemic typhus is carried by fleas. When a flea lands on a human, it may defecate as it feeds. When the person scratches the itchy spot where the flea was feeding, the bacteria-laden feces are scratched into the skin, thus causing infection. The causative bacteria is called Rickettsia typhi. Endemic typhus occurs most commonly in warm, coastal regions. In the United States, southern Texas and southern California have the largest number of cases. Scrub typhus is caused by Rickettsia tsutsugamushi. This bacteria is carried by mites or chiggers. As the mites feed on humans, they deposit the bacteria. Scrub typhus occurs commonly in the southwest Pacific, southeast Asia, and Japan. It is a very common cause of illness in people living in or visiting these areas. It occurs more commonly during the wet season. The four types of typhus cause similar types of illnesses, though varying in severity. Epidemic typhus causes fever, headache, weakness, and muscle aches. It also causes a rash composed of both spots and bumps. The rash starts on the back, chest, and abdomen, then spreads to the arms and legs. The worst types of complications involve swelling in the heart muscle or brain (encephalitis). Without treatment, this type of typhus can be fatal. Brill-Zinsser disease is quite mild, resulting in about a week-long fever, and a light rash similar to that of the original illness. Endemic typhus causes about 12 days of high fever, with chills and headache. A light rash may occur. Scrub typhus causes a wide variety of effects. The main symptoms include fever, headache, muscle aches and pains, cough, abdominal pain, nausea and vomiting, and diarrhea. Some patients experience only these symptoms. Some patients develop a rash, which can be flat or bumpy. The individual spots eventually develop crusty black scabs. Other patients go on to develop a more serious disease, in which encephalitis, pneumonia, and swelling of the liver and spleen (hepatosplenomegaly) occur. A number of tests exist that can determine the reactions of a patient's antibodies (immune cells in the blood) to the presence of certain viral and bacterial markers. When the antibodies react in a particular way, it suggests the presence of a rickettsial infection. Many tests require a fair amount of time for processing, so practitioners will frequently begin treatment without completing tests, simply on the basis of a patient's symptoms. The antibiotics tetracycline or chloramphenicol are used for treatment of each of the forms of typhus. The prognosis depends on what types of complications an individual patient experiences. While children usually recover well from epidemic typhus, older adults may have as much as a 60% death rate without treatment. Brill-Zinsser, on the other hand, carries no threat of death. People usually recover uneventfully from endemic typhus, although the elderly, those with other medical problems, or people mistakenly treated with sulfa drugs may have a 1% death rate from the illness. Scrub typhus responds well to appropriate treatment, but untreated patients have a death rate of about 7%. The relatively high death rate from untreated typhus is one reason why some researchers are concerned that its causative organisms might be used in the future as agents of bioterrorism. Prevention for each of these forms of typhus includes avoidance of the insects that carry the causative bacteria. Other preventive measures include good hygiene and the use of insect repellents. Antibody — Specialized cells of the immune system, which can recognize organisms that invade the body (such as bacteria, viruses, and fungi). The antibodies are then able to set off a complex chain of events designed to kill these foreign invaders. Bioterrorism — The use of disease microorganisms to intimidate or terrorize a civilian population. Endemic — Occurring naturally and consistently in a particular area. Epidemic — A large cluster of cases all occurring at about the same time within a specific community or region. Beers, Mark H., MD, and Robert Berkow, MD., editors. "Epidemic Tyhpus." In The Merck Manual of Diagnosis and Therapy. Whitehouse Station, NJ: Merck Research Laboratories, 2004. Cunha, B. A. "The Cause of the Plague of Athens: Plague, Typhoid, Typhus, Smallpox, or Measles?" Infectious Diseases Clinics of North America 18 (March 2004): 29-43. Ge, H., Y. Y. Chuang, S. Zhao, et al. "Comparative Genomics of Rickettsia prowazekii Madrid E and Breinl Strains." Journal of Bacteriology 186 (January 2004): 556-565. Raoult, D., T. Woodward, and J. S. Dumler. "The History of Epidemic Typhus." Infectious Diseases Clinics of North America 18 (March 2004): 127-140.
an acute infectious disease caused by species of the parasitic microorganism Rickettsia, usually transmitted from the feces of infected rats and other rodents to humans by lice, fleas, ticks and mites. Rickettsiae enter the human body through cuts or breaks in the skin made by the bites of the lice or other pests. Types and Treatment. The principal types of the diseases are louse-borne typhus and flying squirrel typhus, caused by Rickettsia prowazekii; murine typhus, caused by R. typhi; scrub typhus, caused by R. tsutsugamushi; and recrudescent typhus. Louse-borne typhus (also known as epidemic or classic typhus) occurs after feces of an infected louse are rubbed into a break in the skin. After an incubation period of 6 to 15 days, the symptoms begin to appear: headache, running of the nose, cough, nausea, and chest pain. These are followed in a few days by high fever and chills, vomiting, constipation or diarrhea, muscular aching, and perhaps delirium or stupor. A red rash, which may bleed, appears on the trunk and spreads to the arms and legs. After about 2 weeks the symptoms usually subside. Ordinarily louse-borne typhus is not fatal, but it can be, particularly if pneumonia develops or if the afflicted person has heart disease. Its alternative name epidemic typhus comes from the devastation it has caused throughout history. It tends to appear where people are crowded together and are weakened by cold, disease, or starvation. It has many colloquial names, such as war fever, camp fever, and jail fever. Flying squirrel typhus is a type resembling louse-borne typhus but not as often fatal. It occurs in the southeastern United States, almost always in the winter months, and is transmitted to humans by the fleas and lice of the flying squirrel. Treatment is the same as for louse-borne typhus. Murine typhus is a less common variety, also known as tabardillo and endemic, rat, or flea typhus. As indicated by the term murine, it is transmitted by rat or mouse fleas. The symptoms are like those of louse-borne typhus but are less severe, and recovery occurs sooner. Antibiotics are used in treatment. Scrub typhus (called also Japanese river fever and tsutsugamushi fever) is prevalent in eastern Asia and has been carried to other areas by infected persons. It is transmitted by mites and hence is often called mite fever. The rodent responsible for this illness is the field mouse. The rickettsiae are transferred to humans by the bite of the larval form of the mite, usually in the groin or neck. The fever of scrub typhus and its other symptoms are very similar to those of other forms of typhus. It is treated with chloramphenicol and the tetracyclines. Recrudescent typhus (called also Brill-Zinsser disease) is caused by Rickettsia prowazekii, the etiologic agent of louse-borne typhus. The rickettsiae, however, remain in the body after a first attack of typhus and can cause a recurrence (a recrudescence) as long as years after the first attack. The recrudescence is milder than the initial infection, however. Treatment is similar to that for epidemic typhus. Closely related to these forms of typhus are tick-borne rickettsial diseases such as rocky mountain spotted fever. Prevention. Immunizing vaccines are available if an outbreak of typhus occurs or threatens. They greatly reduce the chance of infection, or modify the effects of the disease. Travelers should be vaccinated before visiting countries where the disease is prevalent. Some countries require proof of such protection before admitting a visitor. Insect and rodent control are of great importance in the prevention and control of typhus. Adult lice can be destroyed by spraying garments with DDT. Frequent bathing and changes of underclothes are vital. Outer garments should be sterilized by steam to kill the louse eggs. Fleas and mites are more difficult to control than lice. The best method is to destroy the rodents on which they live. Patient Care. Patients with typhus are initially isolated until they are free of body lice or mites. They are not capable of transmitting the disease without the aid of these vectors. No special precautions are recommended by the Centers for Disease Control and Prevention to limit transmission of the disease. To accomplish removal of lice or mites the patient should be washed with a 1 per cent solution of Lysol upon admission and the clothing must be disinfected or destroyed. Several shampoos may be necessary to eliminate parasites from the hair. Gentle, thorough cleaning is necessary and every effort must be made to avoid damage to the skin in one's enthusiasm for removing lice or mites. The patient is given a soft diet and ample fluids, to prevent dehydration. Efforts are made to conserve the patient's strength and to protect him or her during periods of delirium, which are common. Typhus is a very debilitating disease and requires a long period of convalescence in which the patient's general health must be improved. Nervous and mental symptoms may persist long after the acute phase of the disease subsides. (tī'fŭs), In German, Typhus (abdominalis) refers to typhoid fever, not to typhus, which in German is called Fleckfieber or Flecktyphys. A group of acute infectious and contagious diseases, caused by rickettsiae that are transmitted by arthropods, and occurring in two principal forms: epidemic typhus and endemic (murine) typhus; typical symptoms include: severe headache, shivering and chills, high fever, malaise, and rash. Also called jail, camp, or ship fever. epidemic typhus the classic form, due to Rickettsia prowazekii and transmitted between humans by body lice. flying squirrel typhus an acute infectious disease similar to epidemic typhus, occurring in the southeastern United States; it is caused by Rickettsia prowazekii and is transmitted by the fleas and lice of the flying squirrel. Kenya tick typhus boutonneuse fever. murine typhus an infectious disease, clinically similar to epidemic typhus but milder, due to Rickettsia typhi, transmitted from rat to human by the rat flea and rat louse. scrub typhus an acute, typhus-like infectious disease caused by Rickettsia tsutsugamushi and transmitted by chiggers, characterized by a primary skin lesion at the site of inoculation and development of a rash, regional lymphadenopathy, and fever. Any of several forms of infectious disease caused by rickettsia, especially those transmitted by fleas, lice, or mites, and characterized generally by severe headache, sustained high fever, depression, delirium, and the eruption of red rashes on the skin. Also called prison fever, ship fever, typhus fever. any of a group of acute infectious diseases caused by various species of Rickettsia and usually transmitted from infected rodents to humans by the bites of lice, fleas, mites, or ticks. These diseases are all characterized by headache, chills, fever, malaise, and a maculopapular rash. Kinds of typhus are epidemic typhus, murine typhus, and scrub typhus. See also Brill-Zinsser disease, Rocky Mountain spotted fever. An acute rickettsial infection characterised by fever, headache and rash, similar to (but milder than) epidemic typhus, caused by Rickettsia typhi. MT occurs sporadically worldwide; it is more prevalent in congested rat-infested urban areas. In the US, it occurs in California, Texas and Hawaii. Rash, headache, fever, chills, myalgia, nausea, vomiting, cough; nearly half of patients develop neurological signs (e.g., confusion, stupor, seizures, incoordination). Measles, rubella, Rocky Mountain spotted fever. R typhi is transmitted to humans by rat fleas (Xenopsylla cheopis), Reservoir Rats, mice and other rodents. Brill-Zinsser disease; epidemic typhus; murine typhus, typhus fever Infectious disease A rickettsiosis transmitted by a louse or a flea Clinical Fever, a transient rash, and hypotension caused by either R prowazekii–epidemic typhus, Brill disease–rare in US or R typhi–murine typhus, a mild summer-fall infection most common in southeastern and southern US; < 2% mortality. See Epidemic typhus, Queensland tick typhus, Rickettsia São Paulo typhus, Scrub typhus. A group of acute infectious and contagious diseases caused by rickettsiae that are transmitted by arthropods. Three main forms exist: louse borne (epidemic, recrudescent [i.e., Brill-Zinsser disease], murine (endemic), and scrub (Tsutsugamushi fever). Also called jail fever, or ship fever. Synonym(s): camp fever (1) . A range of infectious diseases caused by Rickettsial organisms, transmitted by different insects and featuring sudden headache, pain in the back and limbs, shivering, cough, constipation, a mottled rash, delirium, prostration, weakness of heart action, stupor and sometimes coma and death. Epidemic (louse-borne) typhus is caused by Rickettsia prowazeki and is common in conditions of civil breakdown and population migration. Rocky Mountain Spotted Fever is spread by ticks, Scrub typhus by mites and endemic typhus by fleas. Q fever may be spread by ticks or by inhalation of infected material. Antibiotics, such as tetracycline, are effective and life-saving in typhus. an acute, infectious disease caused by intracellular rickettsial bacteria, that is characterized by high fever, skin rash and severe headache. The bacteria are transmitted from human to human via the body louse Pediculus humanus, and control of the insect vector is a powerful means of preventing the spread of typhus fever. Rickettsia species; characterized by chills, headache, fever, and maculopapular rash. The infection spreads from infected rodents to humans via bites from fleas, lice, ticks, or mites. Group of acute infectious and contagious diseases, caused by rickettsiae that are transmitted by arthropods, occurring in two principal forms: epidemic typhus and endemic (murine) typhus. Rickettsia and usually transmitted from infected rodents to humans by the bites of lice, fleas, mites, or ticks. acute infectious diseases caused by Rickettsia which are usually transmitted from infected rats and other rodents to humans by lice, fleas, ticks and mites. a disease of humans caused by Rickettsia typhae; rats and cats are the mammalian reservoir. caused by Rickettsia australis. See queensland tick typhus. see rocky mountain spotted fever. caused by Orientia tsutsugamushi. Wild rodents and occasionally dogs may be hosts.